Approximately 5,000 parking spaces are available within two blocks of American Airlines Center. Parking lots open two hours prior to the start of each event and remain open until two hours after the end of each event with prices ranging from $15-30, cash only. Restrooms, including family restrooms, are located in the corners of every concourse. All restrooms are accessible for patrons with special needs. The Center is compliant with the American Disabilities Act, welcomes all patrons and offers a variety of services to meet special needs. Patrons may be dropped off at Valor Place, accessible from Olive Street, for easy lobby access. Elevators are available for access to each concourse level. Accessible seating is available on all levels, however the exact seats may change depending on the event configuration. Assistive listening devices are available free of charge by exchanging a photo ID at Guest Services in the Plaza Concourse at section 104 or in the Terrace Concourse at section 326. Lost property will be turned into the Guest Services. See front-of-house staff to claim lost property. Concessions, including soft drinks, beer, wine, liquor and light snacks, are available for purchase throughout the venue. Cash and major credit cards are accepted. Outside food and beverages are not permitted. Six ATMs are located throughout the venue. See Guest Services for exact locations. 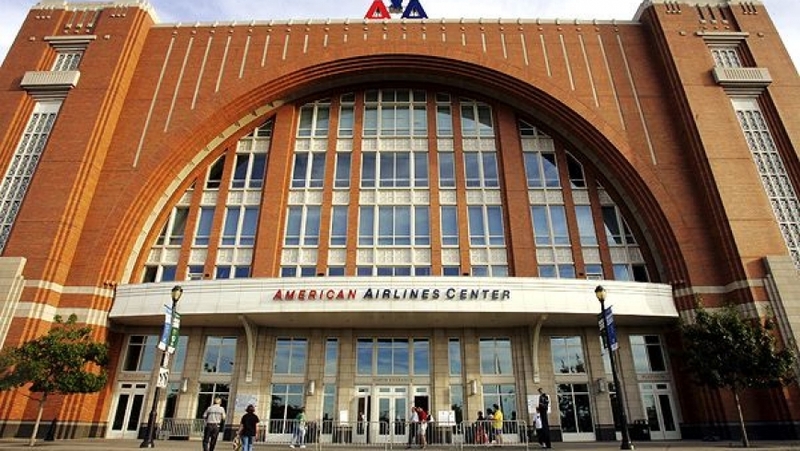 The exterior of American Airlines Center is made of brick, limestone and granite and the signature arches provide an open arm welcome to Dallas’ citizens. The venue has four entrances, one on each side of the building for easy access. The north and south ends of the building feature dramatic outdoor balconies at the Platinum Level with spectacular views of downtown looking over the public plaza and cityscape.